Foreign direct investment (FDI) in South Korea dropped sharply in the first three months of this year from the previous year as foreign companies engaged in less investment amid a global economic slowdown, data showed Thursday. 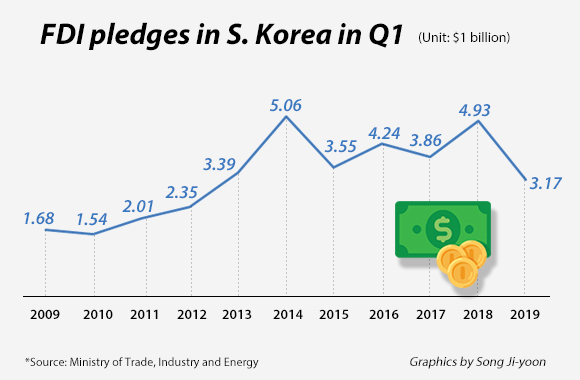 According to the Ministry of Trade, Industry and Energy, Korea received $3.17 billion worth of new FDI commitments in the January-March period, down 35.7 percent from the same period a year ago. Actual investment also dropped 15.9 percent to $2.62 billion during the same period. The ministry said that overall numbers moved down but the quarterly amount hovered around the average of $3.26 billion for new FDI pledges in the first quarter over the last decade. The actual investment amount for the first quarter is 16.4 percent higher than the average of $2.25 billion. The significant on-year drop in the first quarter ended March is due to less investment on a global scale and high base effect as the quarterly amount for last year was $4.93 billion, significantly higher than the 10-year average. Foreign investment companies also advanced investment plans in the second half of last year before the sunsetting of a tax break expired by the end of the year. Global FDI, meanwhile, reached $1.2 trillion last year, down 19 percent from the previous year. Overseas investment volume of each country moved downward for three consecutive years last year, affecting FDI in Korea to drop sharply in the first quarter. By region, FDI pledged by the European Union dropped 47.3 percent on year in the January-March period to $990 million while actual investment was up 30.5 percent to $1.46 billion. Investment pledges from Japan also fell 31 percent to $250 million and actual investment 35.4 percent to $210 million. New FDI committed by the U.S. plunged 78.7 percent on year to $160 million while actual investment from the country fell by a greater margin of 92.3 percent to $70 million. Direct investment pledged from China fell 88 percent to $130 million and actual amount 45.5 percent to $10 million during the cited period.